Steeple Martin is a fictional village in Kent near Canterbury. It's near the fictional coastal resort of Nethergate. In the village lives Libby Sarjeant. She lives with her partner Ben Wilde, who owns Manor Farm and also the Oast House theatre. She is a former actor and loves to paint local scenes. She also has a very inquisitive nature which gets her into lots of adventures and inevitably trouble. Libby is aided by her friend Fran Wolfe who lives in Nethergate. The female vicar tells Libby about a local Abbey, St Eldreda's where there are the ruins of the original monastery and nuns worshipping in a new extension. The original Abbey had a relic - a jewelled encrusted finger from the saint - which was hidden during Henry VIII's dissolution of the Catholic Church. This relic has reappeared and is up for sale. A Herefordshire family, the Beaumonts, had the relic, but there was a recent murder in the monastery and on the body of the dead man was correspondence concerning the relic, but nothing has been seen of the actual relic. However it has now turned up for sale and the nuns would like to know who is selling it. Peter Parker, Fran's husband's cousin, is keen to put on a play in the monastery ruins - murder in the cathedral - Peter lives with Harry Price who owns the local vegetarian restaurant "the Pink Geranium". Peter who is a part-time journalist also directs plays, pantomimes and review musical shows at the Oast House theatre. Detective Chief Inspector Ian Connell arranges for the relic to be on view during the performances of the play. There is sufficient security and Ian wants to see if the murderer will reappear. Instead there is another murder - this time one of the actors in the play but the relic is safe. Libby and Fran can't help trying to help Ian in his investigation but usually make the situation more confusing, with the dead man's wife appearing and also a mystery musician who volunteers his services to the theatre. 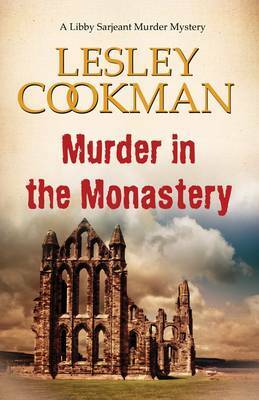 MURDER IN THE MONASTERY is an interesting and undemanding read; two murders, but a pleasant change from some of the very violent murder mysteries around. This is one of a series by the author featuring Libby and Fran. Much is made of Fran's clairvoyance powers which help to solve some of the mysteries. I am not usually a fan of fictional settings, preferring real locations, but I can see the appeal of an idyllic village close to a seaside location. I will certainly read more by this author and would recommend this one as a good read.